HRC are proud to announce their new DataLogging system. What has been used by the factory race teams is now available for the RS125 and RS250 Racing Machines. Continuing to raise the level of competition, HRC answers the call of riders looking for a way to record faster lap times. Developed from years of racing know how, HRC is proud to release data logger race kits for the RS125R/ 250R. The data logger provides detailed information for setting up your machine to meet all kinds of race situations. A good use for the extra channels would be for the analysis of Front & Rear Suspension stroke movements. All of these features are shown in graph form, which you will be able to analyse through your laptop computer. A CD is supplied where you will need Windows98, Me, and 2000. CPU: Pentium 200Mhz/Pentium II 266Mhz. A 12V feed is needed from the bike which will be generated by the A.C.G. 25MB of memory is required. A Japanese/English Manual/Parts List is available. All parts contained within the kit do have individual part numbers. In the event of needing replacement parts, ordering these will be possible. Please see below for a picture of the kit. The HRC Data Analyzer Software allows you to look at your riding from many angles as well as analyze and study the condition of your machine at each point. You can also easily map your data against another rider's. you can eliminate carburettor setting errors and shorten overall machine setup time. One of the main benefits is this, when coupled with the HRC Detonation Counter, is that you will be able to see where detonations occur on the circuit, in which gear position used and at what throttle position opening. HRC's Data Logger is sure to bring the joy of victory to riders competing in all types of categories. 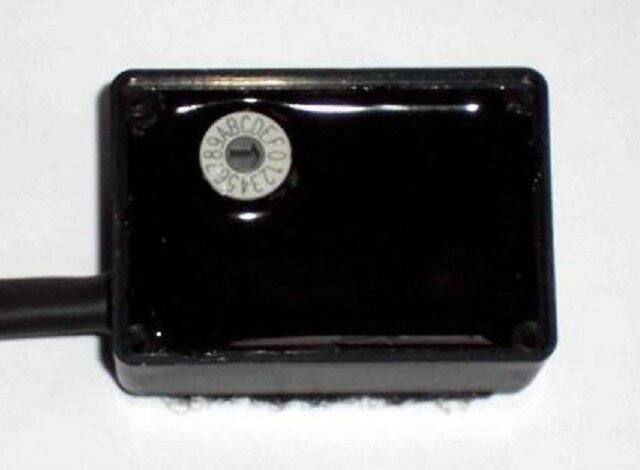 The detonation counter sensor picks up an engine's irregular combustion (detonation) and displays the number of times it occurs on the detonation counter unit. When used with the HRC Data Logger (RS125R/ 250R), the counter provides a detailed detonation map which greatly assists in carburettor setting. Click the button below for information about our replacement Detonation Sensor wire. The unit provides a replacement detonation sensor for the HRC logger or HRC detonation counter and upgrades the system to add a blue flash indicator. 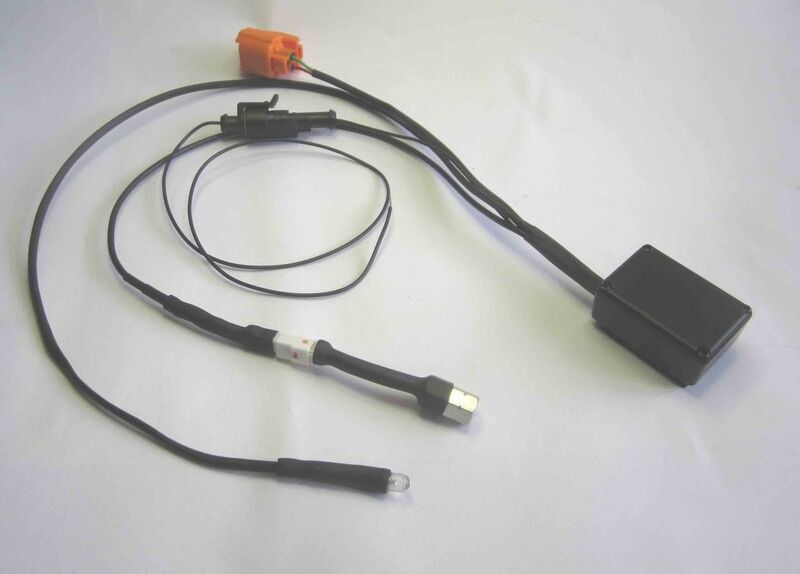  Plug the Orange connector into the counter or logger connection loom, replacing the existing sensor.  Wire the black wire into the black wire feeding the HRC unit.  Feed the indicator up to the dash foam, drill a 3mm hole in the foam and push the indicator through to face the rider. The mounting position should be on the head studs. The sensor should be tightened to the normal head nut tightness. The sensors outside metal surface must make contact to the head or block or steel washer or nut. The inside surface should not touch the top of the stud. The contact of the sensor should be of high quality and clean to ensure the resonance coupling. The whole of the sensors metal surface needs to be in level contact. M6 sensor: the detector has a maximum of 6mm of internal threads. M8 sensor: the detector has a maximum of 8mm of internal threads. Only use a single copper washer between the head and the detector if the washer is required for the water seal such as on the standard head. ​The detector amplifier unit must be mounted at least 80mm away from the ignition coils. Also route all detector cables away from HT leads or the coil. The sensitivity adjustment is by a 15 position switch; 0 is the most sensitive and F is the least. ​Set the sensitivity at the most sensitive = 0. This may show a continuous blue indication while running the engine in normal conditions. Then with the engine running slightly rich, reduce the sensitivity (go towards F) until the light never flashes under load with the RPM in the power band. A typical detonation signal is shown below. If the unit is too sensitive then engine noise will be detected (shown as X), the unit needs to be set higher than that level. The range that detonation is detectable is wide (level Y). Please Note; leaded fuel does not detonate as easily at unleaded fuels, the point of increased detonation on leaded fuel will be much leaner than the optimal fuel setting. The setting of the detonation unit will therefore be affected.
. The effect that the sensor detects can also be caused by mechanical bangs. Worn bearings in the crank or con rod can easily slap against the cylinder head when a higher revs.
. Interference can also cause the detector amplifier to detect non existent detonation, the cables and amplifier must be mounted away from the HT coil, HT wire or the LT coil drive wiring.
. Mid throttle (on the Needle / lean needle) detonation can cause actual detonation to occur that is not damaging to the piston but is still a detonation and will still be detected / counted.